Save the date! TPS has once again partnered with the Dallas Center for Photography (DCP) in Dallas, Texas, to bring you an exciting evening of artist lectures by Frank Lopez and Loli Kantor on Wednesday, March 16, 2016. As founding members of alt8, an alternative processes group based in the Dallas-Fort Worth area, Lopez and Kantor have worked extensively in nontraditional image-making methods. They each will speak about ongoing projects and then address their unique working processes in a subsequent Q&A panel session. Doors open at DCP with a social at 6:30pm, and presentations will begin at7:00pm. Register online in advance to reserve your seat for $5. This event is proudly sponsored by our friends at Frame Destination. Frank Lopez considers himself an Antiquarian Avant-Garde photographer. He explores the different cultures and traditions of China, Korea and Vietnam through photography. Traveling with only a pinhole camera, he concentrates on aspects of local culture and variations of manufactured culture – areas of intentional cultural re-appropriation. Lopez will discuss symbols associated with the found object – slaptags and graffiti art. The juxtaposition of found symbols initially captured with his iPhone and later interpreted into Tintypes and Ambrotypes explores the immediacy of the found object with the seemingly instant 19th Century version of the Polaroid. The ubiquitous smartphone allows the vehicle to bring the 19th, 20th and 21st centuries together. Loli Kantor is a fine art and documentary photographer whose work is concerned with community and the human condition. Born in Paris, France, and raised in Israel, Kantor immigrated to the United States in 1984. Her recent work centers on Jewish life and culture in central and eastern Europe. As the daughter of Holocaust survivors, Kantor brings a deeply personal interest as well as a unique sensibility to this body of work. The project, entitled “Beyond The Forest”, was published by the University of Texas Press in November 2014 and will be available for purchase following the evening’s presentation. Kantor’s work has garnered notable awards and recognition and has been exhibited widely in the United States and internationally. Her photographs are included in museum collections including The Museum of Fine Arts, Houston; the Harry Ransom Center at The University of Texas at Austin; Lishui Museum of Photography in China; and Lviv National Museum in Ukraine as well as numerous private collections in the United States and abroad. The Dallas Center for Photography is hosting two distinguished photojournalists at the Dallas Center for Photography – Sam Abell and Ed Kashi. Both events require registration beforehand through their website. 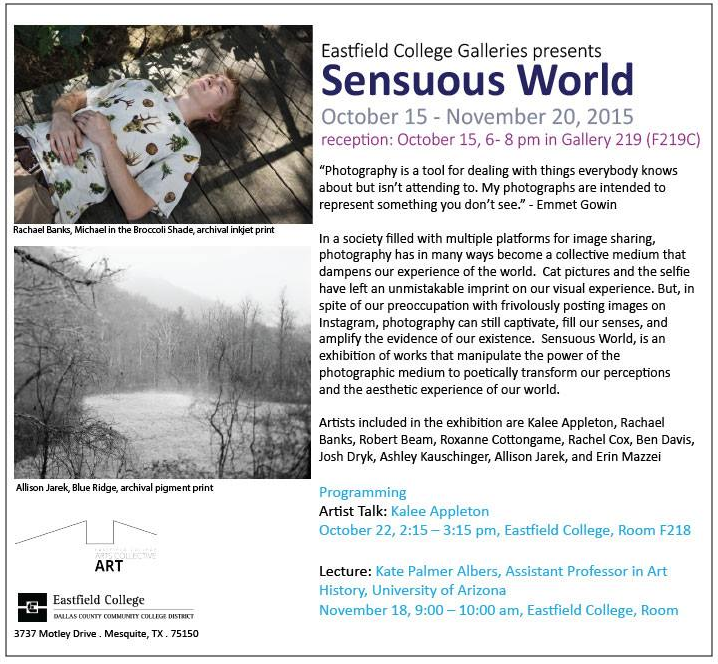 Congratulations to Texas Woman’s University Alumni, Kalee Appleton, Rachael Banks, Josh Dryk, Ashley Kauschinger, and Allison Jarek, for being included in Sensuous World at Eastfield College Gallery 219. The exhibition runs October 15 through November 20, 2015. Kalee Appleton will be giving an Artist Talk on October 22, 2015, from 2:15 to 3:15 PM at Eastfield College in Room F218.